The Mage Knight board game is an epic game of exploration and conquest. 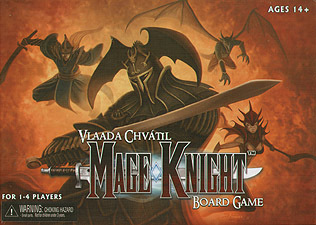 Take control of one of four powerful Mage Knight Heroes and play a variety of competitive and cooperative scenarios as you vie to build your own personal legend. Conquer a mage tower and learn potent Spells, explore a dungeon and discover a priceless Artifacts, or assault a keep and recruit powerful Units to fight for your cause! Level up as you progress through each journey and carefully build your Action deck and Skill set for the mission at hand. Each decision you make will impede or improve your ability to accumulate Fame, acquire legendary loot, and position yourself as the Mage Knight best suited to accomplish your task. After three Days and Nights of adventuring, combat, and conquest, only the Mage Knight of greatest acclaim will be declared the victor!